Located just 36 miles west of Zion National Park, Washington is a great option for those who want quick access to the park, but don't want to sacrifice on services, restaurants and lodging. Take a swing in on this course surrounded by the breathtaking wonder of Southern Utah. Lessons, corporate outings, tournaments, weddings. With majestic mountains in the distance, Green Spring Gold Course brings golfing to a new level. Located in Washington City Utah, off I-15. 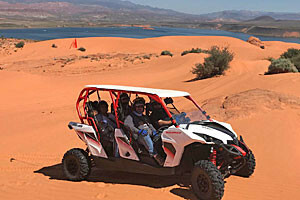 Southern Utah’s premier ATV & UTV Tour Company! A great option for families and groups looking to experience a unique 4×4 adventure. Book your adventure online or call today! Zion Harley-Davidson, located in Washington, Utah. You can find new and pre-owned motorcycles, service, parts, clothing, footwear and much more. Washington is located approximately 36 miles east of Zion National Park. The city has many choices when it comes to lodging and restaurants. Popular area attractions include the Washington City Museum and Red Cliffs Desert Reserve. A small city of approximately 18,000 full time residents, Washington is located just outside of St. George, the largest city in the area. Washington is located approximately 36 miles from Zion National Park off UT-9 in southwestern Utah. The town is located in close proximity to St. George, the largest city in the area. Though Washington City is a small community, its proximity to St. George and Zion National Park mean there are many options for dining and lodging, though most establishments maintain a casual small town feel. Washington City is located in close proximity to Zion National Park and all its outdoor adventures including hiking, camping, biking and horseback riding. The city is also home to a popular golf course. Red Cliffs Desert Reserve: Home to the elephant arch, a small sandstone arch that resembles the eye and trunk of an elephant. Hurricane Valley Heritage Park Museum: A small museum detailing the history Hurricane, as well as the pioneers that built the town. Highlights include period artwork, artifacts, and a historic wedding cake dating back to 1907. The Sears Art Gallery: The Sears Art Gallery located at Dixie State College is home to many rotating exhibits featuring the best of professional, faculty, alumni and student artists. Washington City Museum: Established to help preserve Utah’s history and state culture, The Washington City Museum is home to many unique antiques and historic artifacts. From Zion, take UT – From Zion, take UT- 9 west straight into town. Along the way make sure to enjoy the beautiful southwest scenery including magnificent red rocks, towering mountains, and views of Quail Creek State Park. Washington, Utah is located within Washington County in southern Utah and home to a population of about 8,000.